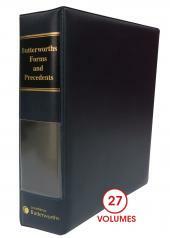 Forms and Precedents is a comprehensive set of non-litigious forms and precedents covering a wide range of topics relevant to the law practitioner across 28 volumes. Precedents are drafted by experts in each field and are authoritative and reliable, being updated regularly with changes in the law. Precedents are preceded by preliminary notes to place the precedents in context and provide a legal framework. The precedents clearly indicate where information needs to be added and this makes them very easy to use and adapt. All precedents are available electronically, even if the printed work is purchased, so no retyping is necessary. Where appropriate, forms are reproduced from the relevant Act or regulation and checklists are included. Mini sets are also available (Banking and Finance, Citizenship, Commercial Transactions, Companies, Construction, Employment, Entertainment, Estates, Insurance, Intellectual Property, Persons and Family, Property, Public Interest Law, Shipping).